• Gozu Tennou head shrine of Hiromine shrine　NEW! I have heard that eating noodles such as spaghetti, udon and buckwheat noodles may make you have a good luck with your love life.It seems that long noodles have an effect to attract your destiny. Peach is said to improve your love luck.I recommend drawing a peach-shaped oracle slip which will tell your fortunes.If you draw a red string, a written oracle will come out.You will be able to get your destiny if you place the peach in the entrance of your house. The kimono-shaped oracle slip will tell your love luck and how feminine you are.A shine maiden told me that keeping the oracle slip in your purse or bag will bring a good fortune in love and find someone special.If you draw an unlucky fortune telling, tying it around the branch of the near tree in the precincts will ward off the bad luck. 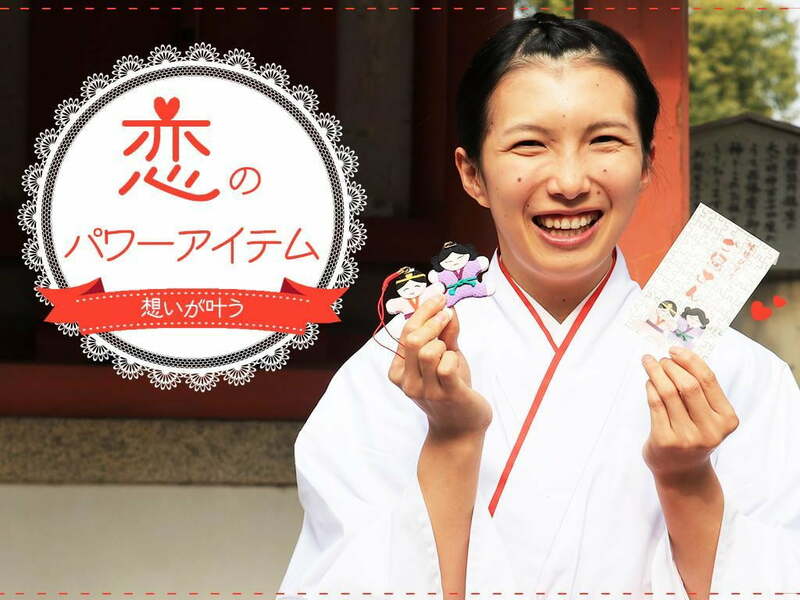 If you can find someone special, carrying the same amulet will deepen your love.A famous historical figure, Kanbei Kuroda who had a relation to the shrine loved only one wife.It is said that visiting the shrine brings you a happy marriage. Itate-hyozu deity is a god of marriage. There are eleven marriage pales which are engraved fifty-five hearts, and each plate is embedded side-by-side along the approach to the shrine. The best way to pray is to walk towards the main shrine while stepping on the eleven plates and worshiping the deity. The eleven plates and fifty-five hearts form a kind of acronym 1151. This is because 1151 sounds like ‘Good Love’ in Japanese. If you are a couple, each person should step on the left and right plates at the same time because 1122 means ‘Good Couple’ in Japanese. This picture shows an amulet charm of match making. Each person of a couple should carry each a boy and a girl charm by wishing that they will be able to be a happy couple. If you are living far from each other, it is recommended the woman to carry a boy’s charm and the man to carry a girl’s charm. You will be able to distract your loneliness by thinking the charm your beloved. If you are in one-side love with someone, you should present the amulet to someone you love, and your love may accomplished. It may become an opportunity to know the words from god by reading a fortune slip and bring a good luck. You can also receive advices from god such as auspicious constellation, blood type, age difference, zodiac sign, azimuth and place. You will be able to get stone amulets which become the shape of the heart when two are combined. If you want to increase your love luck, you can also offer the heart-shaped ‘Ema’ (a votive tablet) by hanging the plate on the special board. When I visited, I saw many tablets which were hung by worshipers from all over Japan. There is a parking which is free of charge within 30 minutes.